The habitants of Tetrachori of Souli, when they were in danger, they hid at their last shelter on the hill of Tripa, whre first there was a tower (Koulia) at the location of Kiafa and also had water (war in 1792). 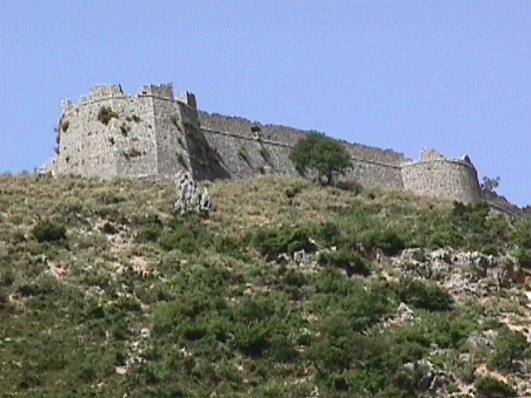 During the war of 1800 against Ali Passia, the habitants of Souli fortified Kougki with two cannons. In 1803 Kougki was exploded by Samouil the monk and its habitants realised their adventurous egress to Parga, Zalogo and the monastery of Seltso. Then Ali Passia on Kiafa built a well-protected castle with a palace – fortress so as not to attack again the fearless habitants of Souli who were his enemies at this region. The castle was built on the hill Bira or Tripa, on a wild place, where there was access only from the east. Walls and polygonal bastions, two entrance gates, scalding, lockers for small weapons, the seraglio of Ali, secret communication corridors, stores, two wells, middel bastions and everything else is possilble for an effective protections, made the castle powerfull and indestructible.